We had a great time at the East Super Regional, finishing 10th in the Hopper Division and were nominated for the Motivate Award! What a great ending to a successful season! Click here to go direct to the below album. PA 3rd Place Inspire! Heading to Super Regionals! inspiration to other teams, acting with Gracious Professionalism™ both on and off the playing field. This team is able to communicate their experiences, enthusiasm and knowledge to other teams, sponsors, and the Judges. 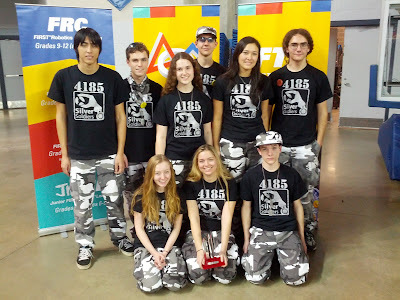 Working as a unit, this team will have demonstrated success in accomplishing the task of creating a working and competitive robot. Way to go Silver Soldiers! At the Lehigh Valley qualifier, we were honored to be chosen by Watt NXT to be a part of their alliance, along with another great team from Wyoming Seminary. We won in 3 matches in the semi finals, then lost in 3 matches in the finals, but what an exciting way to finish. Then, much to our surprise, we came in first place for the Inspire Award! What an achievement! We were selected by the #1 Turnpike alliance captain, the Nanogurus, along with the Landroids, to compete in the finals. This was quite an honor! We won the quarterfinals but lost in 4 games in the semi-finals. We won the PTC Design Award for excellence in robot design. The judges specifically mentioned our robot lift! A great end to a fabulous 2013 season! PA State Championship Finalist Alliance! After finishing in the Top 10, we were selected by the first alliance captain, the Landlords (thanks! ), along with 4077 MASH. We won our semi-finals, then lost the finals 2-1. The last match was decided by 10 points! We also were finalists for the Connect Award, which shows how much we've reached out to the community around us to spread the message of FIRST. FTC Delaware State Championship Winning Alliance! After finishing 10th in the qualifying matches, we were selected by the 2nd alliance captain, FTC 4999 Imagine It, to be in their alliance. We went all the way to the finals and won the final match with the other alliance selection, 237 MFS Hawks! We wish 4999 the best of luck as they qualified for FIRST Worlds Championship! Delaware State Motivate Award winners! The judges loved our team spirit, especially our uniforms! Silver Soldiers Lift Robot 10 inches! 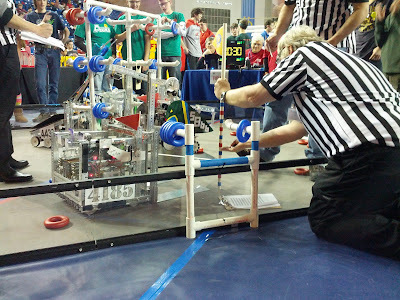 During the qualifying matches, the Silver Soldiers lifted our alliance partners 10 inches during the end game. This was the highest robot lift of the day! The Silver Soldiers finished the season strong at the 2012 World Championship in St. Louis, placing 9th in the Edison Division! We had a 7-2 record, losing a close first match and experiencing a rare disabling static discharge during our 8th match. Most importantly, we had a great time competing with and against some of the best teams in the world. PA State Champs - Going to World Championship! 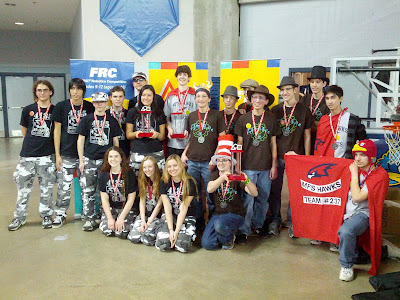 At the FTC Pennsylvania State Championship in Williamsport on February 25, 2012, the Silver Soldiers were the Winning Alliance Captain! We were ranked 5th after qualifying matches and moved up to be the 4th alliance captain. Many thanks to our alliance partners, 4468 The Colts from Lodi, OH and 4102 The Cougars from Maplewood, NJ, who helped us bring home the gold! We had to face the First Alliance in the semi-finals and won 2-1. We went on to win the finals by going the full 3 games and winning! We are now qualified for the World Championship in St. Louis MO, April 25th through 28th. 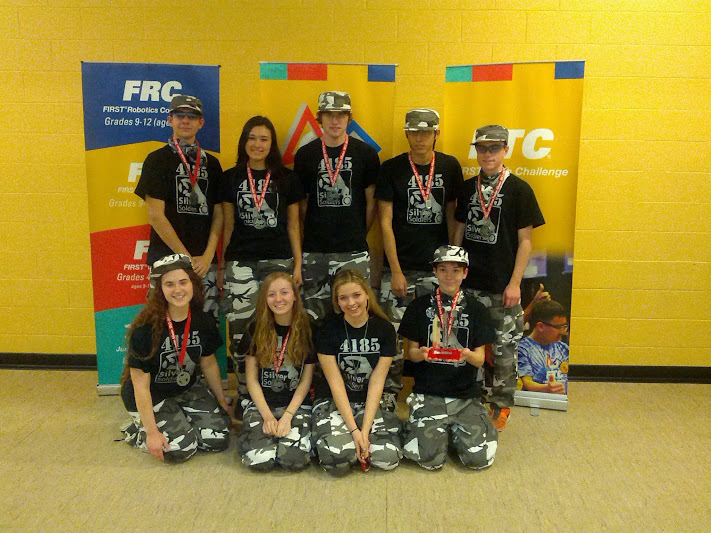 We also won the Rockwell-Collins Innovate Award for our robot design! This is a very prestigious award that goes to the team who thought outside the box, optimized their design for game strategy, and executed the design successfully during the competition. We are featured on a news clip about the OJR FLL tournament!